Participating in the Shiki Kukai is a bit like attending a masquerade party, not that I’ve actually done that. Okay, a bit like how I imagine it would be to attend a masquerade party. After submitting our haiku, and voting anonymously, all is revealed. The funny thing is, I have been participating for so long that I can often predict who wrote what– distinct styles do begin to emerge after a while. It makes me wonder– is my haiku “style” consistent? Sometimes I feel like I am all over the place with my writing! For the latest kukai, the kigo was “ice cream”, and the free format was “day moon”. Both are evocative topics that I will be returning to! In honor of summer, I’ve decided to organize my blog, my writings, and my life in general, in that order. I started with the publications pages of my blog. If someone had asked me how many rengay I’ve written, I probably would have guessed 8-10. On listing them, I discovered that I have written an astounding 20 rengay, all since last August, and of these, 13 are published, and another 4 are in the queue to be published. Writing rengay with others often nudges my haiku and couplets in different directions than if I had just set out to write solo. I love that aspect of it! And it’s fun to get to know other haiku poets better, as we collaborate. I have been writing with Angela Terry and Julie Warther since the three of us met last fall at Haiku North America.We’ve just had our first set of (seven!) rengay published in Notes from the Gean 4:1, June 2012 (pp 119-123): “Fresh Puddles”, “Opening the Locks”, “The Chrome Lure”, “Pink Punch”, “The Steady Drip”, “Sudden Silence”, and “Rolled Up Pants”. The most fun part of writing these rengay, was that they were all written simultaneously, and a report about how that came to be is included as well in the current issue of NFTG. We also have a rengay scheduled to appear in the summer issue of Frogpond. Kirsten Cliff and I began writing rengay together in February of this year, and have since gone on to publish “The Scent of Pine” and “Turning a Corner” in A Hundred Gourds 1:3, June 2012; “Dream Catcher” in fox dreams, April, 2012; and “Into the Night” in Winged Moon, June 2012. Additionally, our most ambitious project to date, “All the Words that Mean Cancer”, a sequence of four rengay, will be published this October in LYNX. It was the toughest rengay to write, dealing with our experiences with leukemia (Kirsten) and breast cancer (me), but also definitely the most heartfelt, and hopefully inspirational to others as well. Just in time for the solstice, Aubrie Cox released a new collection entitled “Winged Moon”, on her Yay Words blog, featuring faeries, trolls, elves, mermaids, and lanterns. I’m pleased to have a rengay included that I wrote with Kirsten Cliff, as well as a haiku. It’s always special to learn that one of my stories has been picked up by Chicken Soup for the Soul. 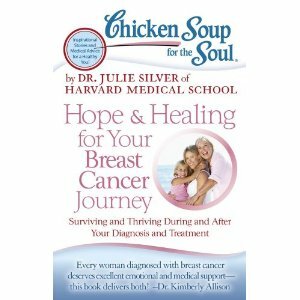 I was informed this morning that my latest story will appear in the upcoming volume Chicken Soup for the Soul: Hope and Healing for Your Breast Cancer Journey. Even after five years, it’s still difficult for me to write about my cancer journey– it is truly something I would much rather forget about altogether. But it is always with me, and not only is it cathartic to deal with it through writing, it is my hope that by addressing the issues that arise in an honest and open, while still life-affirming way, this will help others facing their own diagnoses. The book will be released on September 4, 2012, and can be ordered from Amazon, or I will have a limited number of copies to sell.